The Business Roundtable CEO Economic Outlook Index is based on a survey — conducted quarterly since the fourth quarter of 2002 — of our member CEOs’ plans for hiring and capital spending, and their expectations for sales, over the next six months. Taking these factors together, the survey signals the direction of the U.S. economy. 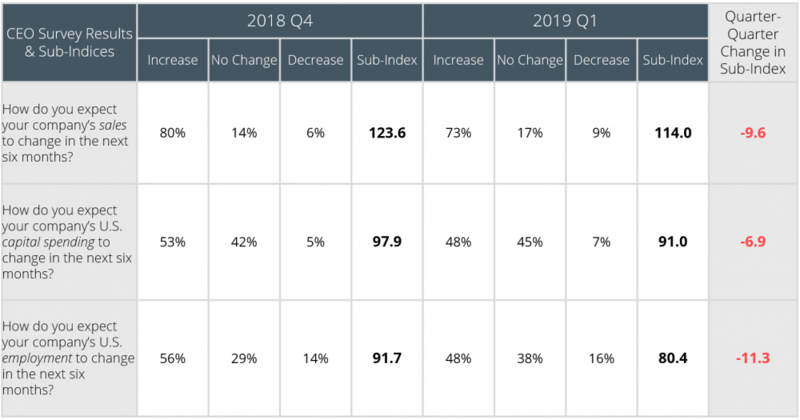 Business Roundtable today released its Q1 2019 CEO Economic Outlook Index – a composite of CEO expectations for sales and plans for capital spending and hiring over the next six months. While the Index eased in the first quarter, potentially reflecting uncertainty about softening global growth, CEO plans remained historically strong. CEO plans for hiring decreased 11.3 points to 80.4, which ranks among the top 10 highest values for the employment sub-index in the survey’s 16-year history. Plans for capital investment decreased 6.9 points to 91, which is among the top third of all values of the capital spending sub-index. Expectations for sales decreased 9.6 points to 114, which is above the historical average for the sales sub-index. In the Q1 2019 survey, CEOs responded strongly on the need for federal action to address consumer data privacy issues. With the European Union’s General Data Protection Regulation in effect and more than a dozen privacy bills advancing across U.S. states, 80 percent of CEOs said it was “somewhat” or “very” important for Congress to enact a national consumer privacy law. The strong CEO response on consumer privacy underscores the wide agreement among business leaders that federal legislative action is urgently needed to establish and protect core consumer privacy rights, promote innovation and reduce regulatory fragmentation. All three of these crucial objectives are addressed in the Business Roundtable consumer data privacy framework released in December 2018. The Business Roundtable CEO Economic Outlook Survey, conducted quarterly since the fourth quarter of 2002, provides a forward-looking view of the economy by Business Roundtable member CEOs. The survey is designed to provide a picture of the future direction of the U.S. economy by asking CEOs to report their company’s expectations for sales and plans for capital spending and hiring over the next six months. The data are used to create the Business Roundtable CEO Economic Outlook Index and sub-indices for sales, capex and hiring expectations. These indices are diffusion indices that range between -50 and 150 — where readings at 50 or above indicate an economic expansion, and readings below 50 indicate an economic contraction. A diffusion index is defined as the percentage of respondents who report that a measure will increase, minus the percentage who report that the measure will decrease. The first quarter 2019 survey was conducted between February 20 and March 8, 2019. Overall, 139 CEOs completed the survey. Results of this and all previous surveys are available at brt.org/resources/ceo-survey.